Although this post is secular in nature, it is very much geared to provident living. For full disclosure, the tool this article is focused on was developed by a client of mine, but it's so cool that I had to share. And I'm not even a very frequent online shopper. If you do any shopping online, you seriously should check-out this browser add-on that automatically identifies any coupons or discount codes, then lets you select the one you want from a drop-down when you checkout. The tool is available now and works in Internet Explorer, Firefox and Chrome. It's called the BeFrugal Add-On. The tool crowdsources coupons, so if someone uses a code on a site that isn't already in the system, once it's accepted by the merchant, the code is added to the online database for that site, benefiting all Add-On users. 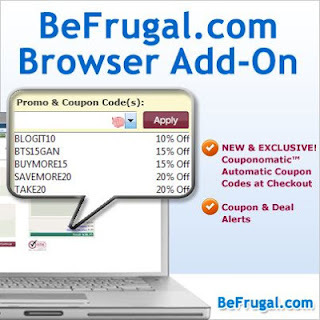 If you ever do any shopping online and find yourself going from site to site looking for coupons and discount codes, the BeFrugal Add-On is bound to save you tons of time and money. It automates the whole online discount shopping process, which, I suppose, is why it's called Couponomatic™. I think the add-on is the digital version of what some families do around the kitchen table each week, clipping coupons and filing them for later in-store use. 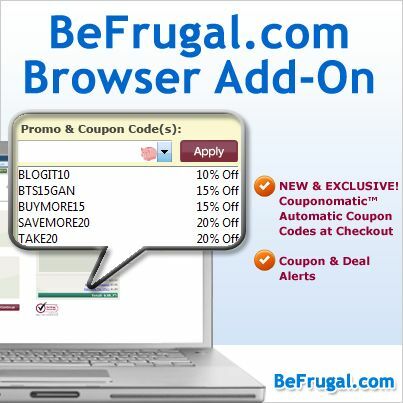 That was then, the BeFrugal Add-on is now — a discount shopping tool for the digital age. Also, BeFrugal has a cash back program that works at more than 3,000 sites covering 80% of the top 500 online retailers. So in addition to discount and coupon codes, shoppers can receive cash back through BeFrugal, requesting a PayPal deposit or check in the mail once their account reaches $25. As I said, I'm not a big online shopper, but I'm really impressed with this tool. I think it will be a game changer for Internet shopping. I'm going to use it this holiday season. Give it a try and let me know what you think.